Samsung Galaxy S8 review | What Hi-Fi? After the issues with last year’s Note 7, Samsung desperately needs the Galaxy S8 to be special. More than just a smartphone, it also has to be a statement. And we think it has succeeded. The Galaxy S8 is one of the best phones we’ve seen, displaying style, power and performance in equal abundance. Could it be a contender for phone of the year? You bet. Samsung is not the only manufacturer to stretch its aspect ratios in 2017. LG also did so with the G6. Samsung, however, has done it with a lot more pizzazz. Not only does the 18.5:9 setup mean the 5.8in screen stretches almost the entire length of the phone, it’s also taken what it’s learned from its Edge family to ensure there are no discernible bezels to the left and right. The result is a bright display in a much slimmer body than a traditional 16:9 screen could fit into. This means it’s comfortable to use one-handed too – the top of the screen might be just out of reach, but left to right is easily covered with a thumb-swipe. To suit its offbeat dimensions, the S8 has a slightly unusual 2960 x 1440 resolution, but comes with Full HD out of the box. The idea here is to save battery life but, for the best experience, you’re going to want to go into settings and up it to its maximum. Not least because videos will zoom in and scale to the screen (you can turn this off if you prefer black bars), which makes the 1080p images look a little softer on detail than we’ve noticed on previous Samsung phones. This scaling also seems to have an impact on motion too, which isn’t as smooth as we’re used to. The AMOLED panel does a great job with contrast though, offering up the deepest blacks going - with bright, punchy highlights as a counterpoint. As we’ve found with other Samsung phones in recent years, the colour palette is still somewhat hit-and-miss. The 'Basic' colour mode is probably the most natural-looking of the selection, but can look a little dull, while the 'AMOLED Cinema' mode gets whites looking brighter but can look a touch overdone with bolder colours. We opt to use 'Basic' for the most part, but it is worth hopping into the menus to see which suits your preferences. Alongside its bigger sibling, the Galaxy S8 Plus, the Galaxy S8 is the first phone to receive the Mobile HDR Premium certification, meaning it’ll be ready and waiting to take on HDR video as soon as the likes of Amazon and Netflix start streaming it to mobile. From a previous mobile HDR demo, the tech certainly made a difference to the smaller viewing experience, widening the colour gamut and introducing more detail to highlights. We’ll be sure to update this review once there’s some content for us to test out. 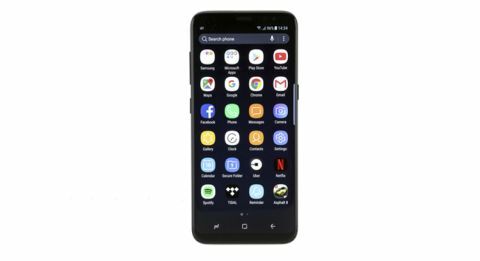 Finally, Samsung’s 'always-on' display makes a return to the Galaxy S8, offering details like time, date and important notifications on the home screen without you having to wake it every time. Samsung claims this drains less than one per cent of your battery every hour, significantly less than opening your phone up all the time. You can also set the times you want it to be on, so your phone isn’t a flashing beacon of light and beeping notifications when you’re trying to sleep. While the S8’s look-at-me screen is a huge part of its design, there’s plenty more here that helps make this one of the best-looking phones we’ve ever seen. Flip the phone over and the back panel is covered in the same Gorilla Glass 5 as the front, with both sides curving round to meet a slim aluminium frame at its middle. This is polished up, so the whole thing feels almost seamless when you move it around in your hand. This might all sound pretty slippery, but the combination of its slim profile and narrower body makes holding it feel secure enough for one-handed use. Samsung has had to step away from some of its design comfort zones to make the S8. For a start, the home key and soft buttons are now gone and replaced by on-screen versions, and the fingerprint scanner has been moved to the back, next to the camera. On the LG G6 this back placement works, as it’s fairly low down and positioned exactly where your index finger would fall when you hold it. But on the S8, it’s much higher and a little bit awkward. You end up having to shift your grip upwards in order to hit it, and we find it’s not always as reliable as we’ve known Samsung’s scanners to be. It’s also annoyingly close to the camera, which means there’s a high probability you’ll have smeary misplaced fingerprints on the lens when you come to take a photo. There are other options for unlocking the phone though (aside from the regular PIN or password). These include facial recognition, which isn’t the most secure or reliable from our tests, and iris scanning. Iris scanning was first introduced on the ill-fated Note 7, but has been vastly improved here. You don’t have to be quite so particular with how you hold the phone to get a match, and it works fine with people who wear glasses too. It’s not a foolproof method by any means. Both low light and bright light can catch the scanner out and, overall, we’d prefer a well-placed fingerprint scanner. But it’s a small hiccup in what is otherwise a really impressive design. Far from just a pretty face, it’s also IP68 waterproof to 1.5m for 30 minutes, with its USB-C and headphone ports fully protected without the need for unsightly rubber covers. On paper, the Galaxy S8’s main 12MP camera looks almost identical to the one in the S7 and S7 Edge, but a few clever software tweaks ensure it’s even better. This includes the multi-frame image processing, which takes three pictures and combines them for the best result. You’d never know the camera was so busy though – the S8 can fire shot after shot in good light without hesitation. Pictures look great. Outside shots are clean, sharp, and full of detail, with a bold but believable colour palette. Optical image stabilisation and dual-pixel autofocus work together to keep things looking crisp, but even in low-light situations, the S8’s images look clean and Instagram-able. Darker shots are slightly smoother than you might find on the iPhone 7 Plus, which lets in more noise. However, the S8’s bright f/1.7 aperture does well to lighten up the shot more convincingly than the iPhone. The selfie-cam gets an upgrade to 8MP and comes with autofocus – a rarity in front-facing snappers. Samsung’s selfie images have always tended to look a little too processed and smoothed for our tastes, but there’s at least a touch more detail now. The camera app is easy to use. All the main controls sit on the main screen, including flash and HDR, plus a shortcut to settings for image quality options. Swiping left brings up a choice of filters, while right reveals a handful of modes including 'Pro', 'Panorama', 'Selective focus' and 'Slow motion'. Video is available all the way up to 4K resolution at 30fps, though you’ll get the most stable footage with the electronical stabilisation available at 1080p/30fps. The S8 performs well under pressure, and we don’t notice any slowdowns at all during use. That’s down to the S8’s Exynos 8895 processor, with 4GB of RAM, offering enough grunt to keep the S8 chomping through task after task. Battery life is one area that doesn’t seem to have moved on though. Last year we found the S7 Edge dropped 13 per cent during a 90-minute movie at full brightness. Using a one-hour movie at half brightness this time, the S8 drops 10 per cent in that time. Take the screen’s resolution down to 1080p and it fares slightly better, but it’s something worth remembering if you’re a power user. With fast charging included, it doesn’t take long to get a boost should you be caught short. In an hour of charging, the phone went from flat to 73 per cent. There’s also wireless charging here too (though this will be slower). Samsung deserves a pat on the back for its user interface here. It has taken a real step back from the pre-installed bloatware it had a reputation for. It’s hardly a vanilla Android experience – the UI still looks every bit a Samsung one and there are still a few add-ons – but it doesn’t double up on the apps Google does better, like Chrome web browser or Gmail. It even leaves things like a music player up to the user to download, in case you’re more of a streaming fan. You can play any stored music via the pre-installed My Files app, but it’s not hugely music-friendly and only plays one track at a time. It’s also worth mentioning Bixby, Samsung’s voice assistant that’s looking to take on the likes of Alexa and Siri. It launches on the S8 but stays relatively dormant for now, because the all-important voice support isn’t actually ready yet. For now, you’ll find Bixby Home sitting to the left of the homescreen, which is a location-aware information aggregator a bit like Google Now. It pulls together useful tidbits like your calendar, reminders and weather information into a range of scrollable cards, alongside customisable news stories plucked from Upday. You’ll also spot a Bixby Vision feature built into the camera app too. This is still pretty limited for now, but the idea is that you can take a photo of an object and shop for it on Amazon, search for information on your surroundings using a photo of a local landmark or take a snap of some text to either translate or transcribe it. We try most of them with varying levels of success, but expect we’ll see improvements here once Bixby launches properly. Samsung certainly seems to be banking on Bixby being a success, because the assistant even gets its own dedicated launch button on the S8. It’s on the left side underneath the volume rocker. We’ll leave it to you to guess how many times we’ve hit it by accident. Samsung’s audio has been quietly improving for a few years now, and the S8 shows off its work in this area by including better quality earbuds in the box. Headphone manufacturer AKG supplies the included in-ears, which offer a braided cable for better durability, and a selection of different tips for best fit. That already makes them better than most in-box freebies. They’re a little bass-heavy for our tastes though, with not much detail to speak of in the lower frequencies either. The midrange fares better in this respect, sounding clear and expressive, with a good amount of get-up-and-go to boot. Even the treble stays in control. The buds don’t tell us lots about the goings-on in the higher register, but at least they steer clear of sounding harsh. The midrange clarity alone means they’re better than the buds you usually find bundled with your phone, but they still lack some of the refinement and dynamics of better headphones. If your budget can stretch to a £40 upgrade to the SoundMagic E10S, or over-ears like the AKG Y50s, your music will thank you. As a source, the S8 is still beaten by the likes of the iPhone 7 Plus. However, things continue to get closer between the two, and the S8 shows promising levels of detail resolution and space, particularly with better quality music. On that note, the Galaxy S8 supports hi-res audio files up to 24-bit/192kHz PCM and DSD128. That’s something we’d like to see from Apple. MORE: Samsung and Harman: the perfect marriage? The Galaxy S8 is just the response Samsung was looking to deliver to its critics. A stunning phone inside and out, it takes all that was good about the S7 family and builds on it, with superb results. It’s not perfect – battery life doesn’t take the leap forward we’d have liked, and there’s still some work to be done on getting the colour palette looking as natural as the iPhone – but the rest of the experience means these feel like niggles rather than dealbreakers. At almost £700, it’s one of the most expensive phones you can buy. But if you’re on the lookout for an upgrade in 2017, the S8 demands to be on your consideration list.